I found this piece of an oar on my honeymoon in Croatia. My wife and I were there in 2005. 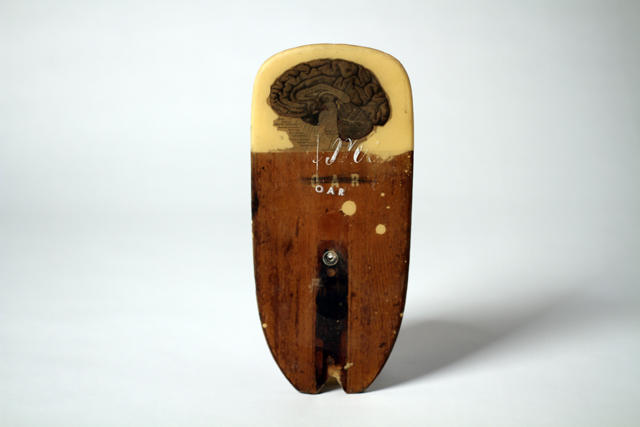 I brought it home and eventually used it as a prop in an animation about the process of sight (hence the brain image). When Oliver moved to the states and we shared a studio, I screen printed 'OAR' on it, which was the name of the collective he, his brother Rory, Duke and I operated under in some of our art project endeavors. So there it is. That's what this thing is and why it looks like it does.